"This town's future quality of life, including its economy, will be significantly influenced by how effectively it continues to expand, preserve, and promote its little stretch of the vast, national Lincoln heritage landscape." Scroll down this page for ordering information, or click here to take you directly there. For generations and in many ways, Lincoln, Illinois—the only town named for Abraham Lincoln before he became famous—, has searched for, commemorated, exploited, and sometimes neglected its Abraham Lincoln-related history and the Lincoln legend in general. The tradition of engaging in these activities forms the town's namesake heritage, and this book probes the questions of how this town has created that heritage and how well it has done so. 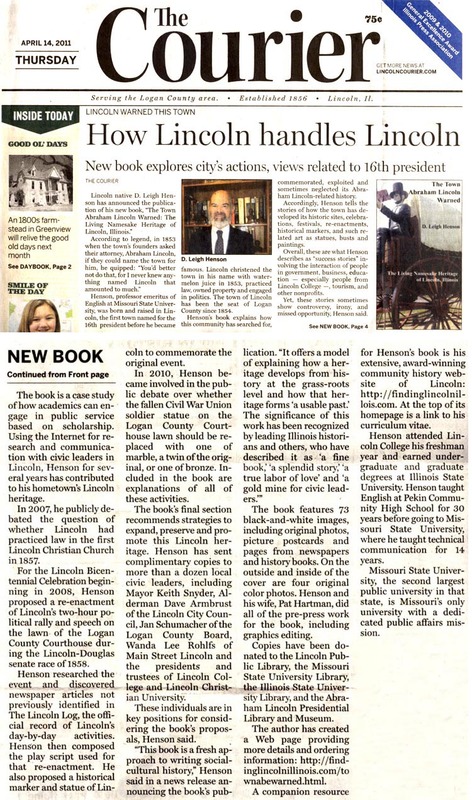 This book is not just a new history of the first Lincoln namesake town―it is a new kind of local history because it blends Lincoln heritage-related reminiscence from the author's years of growing up in the first Lincoln namesake town in the 1940s and 1950s; his history research; accounts of his community service of recent years relating to the local Lincoln heritage; and his commentary on the town's Abraham Lincoln-related literature, art, and civic life. The last part, "Conclusions and Recommendations," recommends strategies for how to expand and promote this local Lincoln heritage to increase civic pride and heritage tourism―with significant economic benefits. This book explains a prairie town's place in state and national history. Press release for the book's publication (4-12-11) (PDF). How to order this book. Publication data: 9" x 6," xxvi pp + 214 pp. = 240 total pages, three color photos inside the cover, 73 grayscale illustrations (mostly original photos, a couple of picture postcards, a few scanned pages of documents, and a photo of a painting in the Abraham Lincoln Heritage Museum of Lincoln College), 300 endnotes with dozens of sources cited ranging from published histories of Lincoln and Logan County to major Abraham Lincoln biographies and to the creative writing (literature) of Lincolnites Langston Hughes, William Maxwell, and Robert Wilson. Below is the front cover, featuring the author's photo of "The World's Largest Covered Wagon" on historic Route 66 in Lincoln. This landmark is an example of American popular culture's fondness for having fun with the Lincoln heritage. For more information about this landmark, see http://www.waymarking.com/waymarks/WMCMCM_Worlds_Largest_Covered_Wagon_plus_Abe_Lincoln_IL. 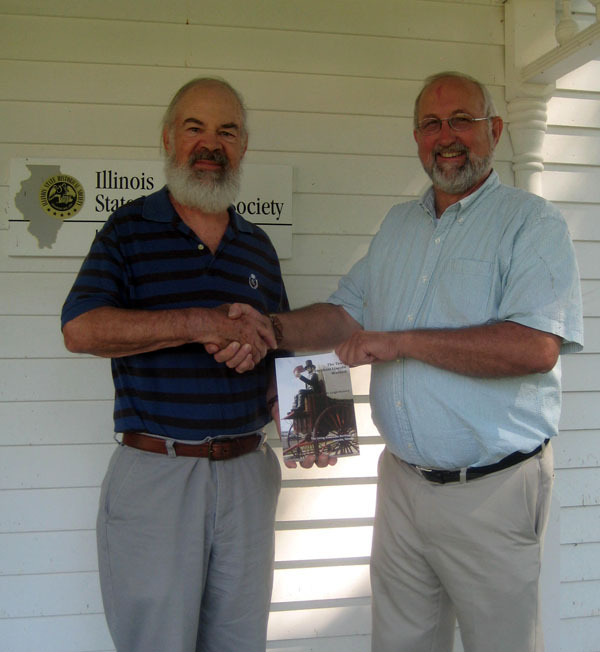 Springfield, Illinois, August 24, 2015: Bill Furry, executive director of the Illinois State Historical Society, accepts donation of copies of The Town Abraham Lincoln Warned. http://www.historyillinois.org/. "Abraham Lincoln tenaciously struggled to attain his 'peculiar ambition' of earning respect—but was widely and severely criticized during the Civil War and perhaps would have been amazed at the world-wide fame he achieved in posterity. For generations and in many ways, Lincoln, Illinois—the seat of Logan County since 1854—, has searched for, commemorated, and exploited its Abraham Lincoln-related history and the Lincoln legend in general as this town has aspired to 'amount to something.' 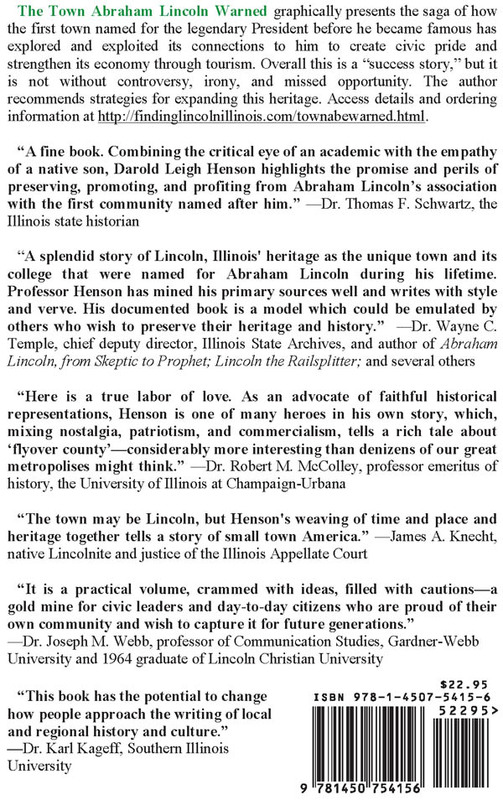 The tradition of engaging in these activities forms the namesake heritage of Lincoln, Illinois, and this book probes the questions of how this town has created that heritage and how well it has done so. 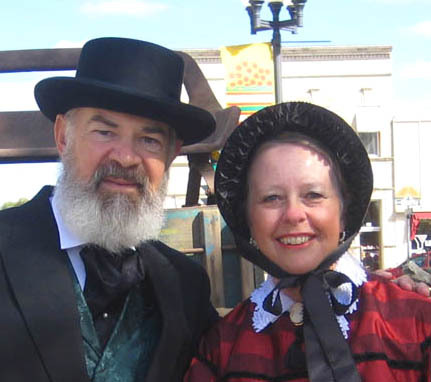 The foundation of the Lincoln heritage of this community consists of Mr. Lincoln’s legal work and social activities in Postville and Lincoln, his role in the founding of his first namesake town, his ownership of a lot on the square, and his political activity in these settings. 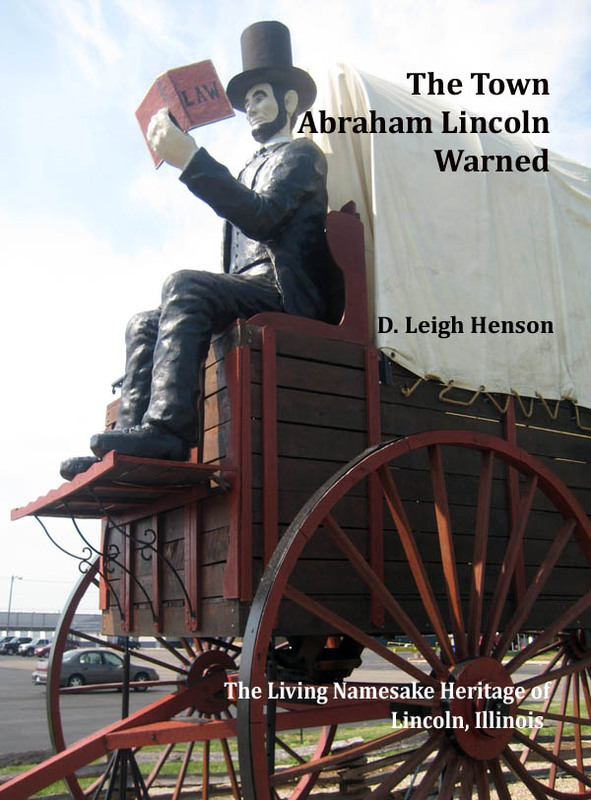 This book tells the story of how this community has explored its Abraham Lincoln-related history and developed its Lincoln-related historic sites, historical markers, celebrations, re-enactments, and festivals. Also discussed are the works of art relating to the local historic sites and Mr. Lincoln, including locally produced or owned literature, statues, busts, photos, drawings, paintings, film/video, and other commemorative works. The story of the Lincoln heritage in his first namesake town has involved the civic engagement and interaction of individuals, government, educational institutions, business and industry, and nonprofits. The research used to investigate these relationships and the heritage they developed encompasses such primary sources (those contemporary to events) as newspaper articles, reminiscence, and the personal experience of my community service. Of course, numerous secondary sources are used as well, including publications for academic and general readers. The study of this Lincoln heritage reveals the community’s or an individual’s sometimes faithful adherence to facts, sometimes the struggle to distinguish between fact and myth, and sometimes an eager association of the local Lincoln heritage with Lincoln lore in general, including the odd, sometimes controversial treatments of him seen in popular culture. Countless creative and scholarly works have been written to portray and explain local and regional history, but there is a lack of research and publication on how communities have used their history to construct heritage. Thus, this study of how the first Lincoln namesake town has developed such a heritage provides an original approach to writing social-cultural history." Access a PDF of the title page; copyright page (with explanation of the four cover photos); dedication page; commentary by various historians, including Professor Emeritus Paul Beaver; the table of contents; list of illustrations; foreword by Professor Joseph M. Webb, Ph.D. (salutatorian of the LCHS Noble Class of 1960 and Lincoln Christian University, Class of 1964); preface; and acknowledgments. Note: the images in these pages have some interesting details that can be seen better by increasing the PDF size from 100% to 200+%. Press release for the book's publication (4-12-11) (PDF). Adobe Reader is free and easy to use. Download Adobe site: http://get.adobe.com/reader/. This book of local history (petits récits) is written in plain English and will appeal to the general reader as well as the academic. The book will appeal to anyone interested in the local and national lore of Abraham Lincoln--the verified history and legends associated with him--and to those curious about how a community develops a heritage based on its unique history. 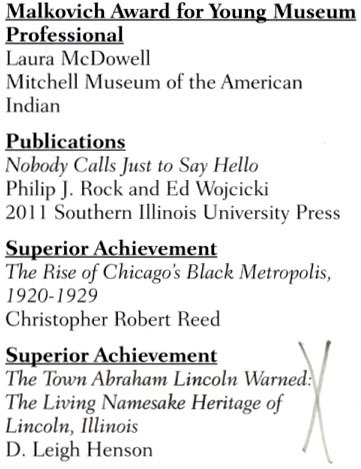 The book will also appeal to those interested in the history and literature of the Midwest and Illinois. It will especially appeal to anyone living in his first namesake town and Logan County--past, present, and future--and certainly would be suitable as a keepsake and gift for friends and relatives. Access news release published by Missouri State University: http://news.missouristate.edu/2011/04/12/henson/. Purchase option 1: Send check or money order for $22.95 per copy plus $4.00 shipping within the U.S. (U.S. Priority Mail), $26.95 total. Make payment payable to D. Leigh Henson, and mail to the PO Box address below. For shipping outside the U.S., contact the author for a shipping quote. For all three buying options, a second copy purchased at the same time and sent to the same address can be included without an additional shipping charge. Bookstores receive a discounted rate. Email the author: DLH105f@sbcglobal.net. Sales are final. Purchase option 3: Buy the book on Amazon.com at http://www.amazon.com/The-Town-Abraham-Lincoln-Warned/dp/1450754155/ref=sr_1_1?s=books&ie=UTF8&qid=1335019078&sr=1-1. Purchase option 4: Buy the book on eBay at http://cgi.ebay.com/ws/eBayISAPI.dll?ViewItem&item=380351090237. Darold Leigh Henson was born (1942) and raised in Lincoln, Illinois. He graduated from Lincoln Community High School (LCHS) in 1960. After attending Lincoln College his freshman year (1960—1961), he earned a bachelor’s degree from Illinois State University with an English major and history minor. He taught English at Pekin Community High School for thirty years (1964—1994), and during that time he earned a master’s in American literature and Ph.D. in English studies, both from Illinois State. Also during his Pekin years, he taught freshman composition part time at Illinois Central College for several semesters. In the mid-1980s he was a part-time writing consultant and freelance writer and editor whose clients included local engineering firms and Caterpillar Inc. [sic]. From 1990 to 1993 he was a founding partner of Technical Publication Associates, Inc.
Beginning in 1994 he taught technical and marketing communication in the English Department of Missouri State University until becoming professor emeritus in 2006 and then taught online for two more years. His articles about the theory, practice, and teaching of writing have appeared in several academic journals. In recent years he has been a member of the Illinois State Historical Society. His article on the social-cultural history of the town of Lincoln as seen in William Maxwell’s writings and his article on Mr. Lincoln’s 1858 namesake town rally-speech were published in the Journal of the Illinois State Historical Society. He has begun research on a book titled The Rhetorical Education and Development of Abraham Lincoln Before His Presidency. Henson is blessed that Patricia Hartman is his wife. By a previous marriage, he has two wonderful children, Kendra Henson and Brandon Henson; and they are much interested in their Lincoln roots. Henson’s hobbies include boating, fishing, and visiting historic sites in Illinois. 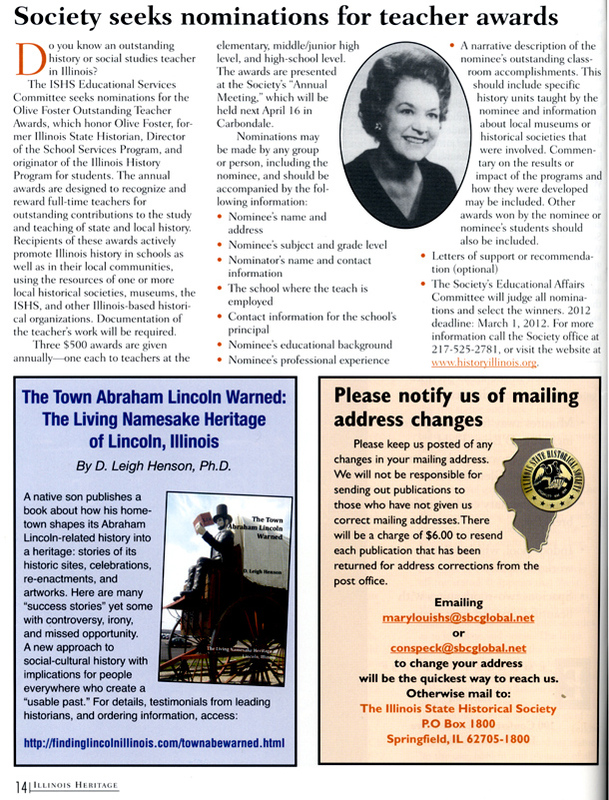 Access Henson's curriculum vitae at http://findinglincolnillinois.com/DLHensoncv5-11.pdf. Access Henson's page at Illinois Authors: http://www.illinoisauthors.org/authors/Darold_Leigh_Henson. 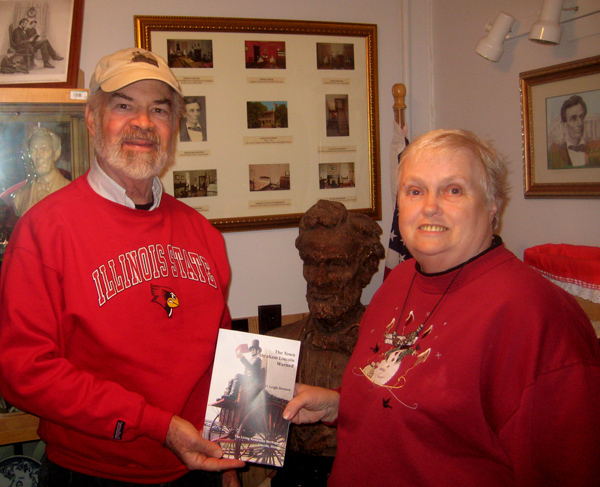 His award-winning community history Web site of Lincoln, Illinois, is a companion resource for this book, and the Web site has a great deal of additional information about Abraham Lincoln's law practice in Postville and his first namesake town, plus many more color photos: http://findinglincolnillinois.com. Link to how to order this book.